Mix juice (containing acid) with baking soda. The reaction produces CO2 gas, which makes the juice into a fizzy soda. For older students, use different juices which vary in their acidity and produce different amounts of gas. baking soda, a small cup. Kindergarten students might need their baking soda pre-aliquotted into tubes. If doing Procedure B (comparing different juices), you will need additional fruit juices, each juice in a squeeze bottle. Include lemon juice (not sugared), and apple juice, as well as the orange juice. Optionally include cranberry juice. optional for older students: molecule models, or equivalent (e.g. clay and toothpicks). You will need 2 white H atoms, one black C atom, 3 red O atoms and 6 bonds to model one reaction. Procedure A makes a soda drink with orange juice and baking soda. The students find out where the bubbles come from. Good for all ages. 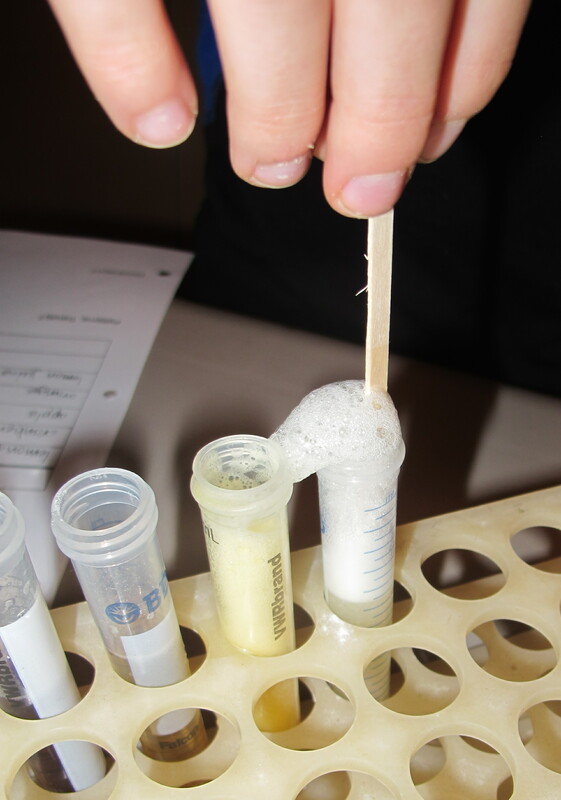 Procedure B compares the amount of bubbles made when baking soda is added to different juices. Students learn about acidity. Best for intermediates. 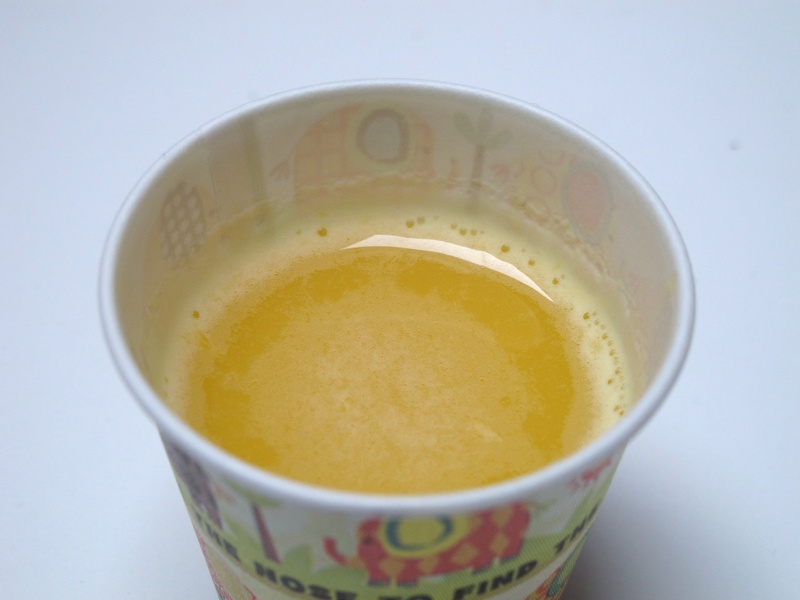 Fill a dixie cup with juice. Drink a little of it to see what it tastes like before the experiment. Scoop up about 1/8 teaspoon of baking soda, using a tiny scoop or a coffee stir stick. Tip it into to the cup of juice and stir it in. Look carefully for tiny bubbles rising to the top of the liquid. Listen for bubbles popping on the surface (quiet is needed to hear them). Taste the juice again - the juice should be fizzy. Discuss the state changes during this chemical reaction: a liquid and a solid produced a gas. The gas bubbles stayed in the liquid, to make the drink taste fizzy. The specifics of the reaction can be discussed: the bubbles are carbon dioxide, formed by the chemical reaction between an acid (the juice) and a base (the baking soda). 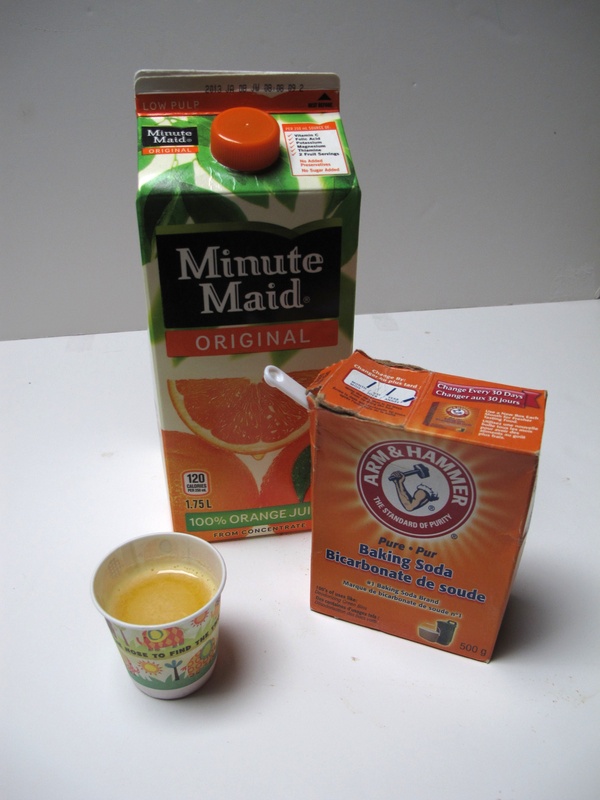 Give students molecule models of the molecules in baking soda and orange juice. Ask them to figure out the new molecules that are made when the baking soda and orange juice mix, by taking apart these molecules and rearranging the atoms to make new molecules. Give them a hint that one of the new molecules is water (show a model), and ask them to use up all the rest of the atoms and bonds to make the other molecule. See the molecule photo above. Note that the CO2 molecule has two double bonds - students may need prompting to fill up all the holes in the atoms to complete this molecule. Once all students have made their water and CO2 molecules, name the carbon dioxide molecule and ask if students have heard of it. Tell them that it is a gas, and this is what makes their soda drink fizzy. 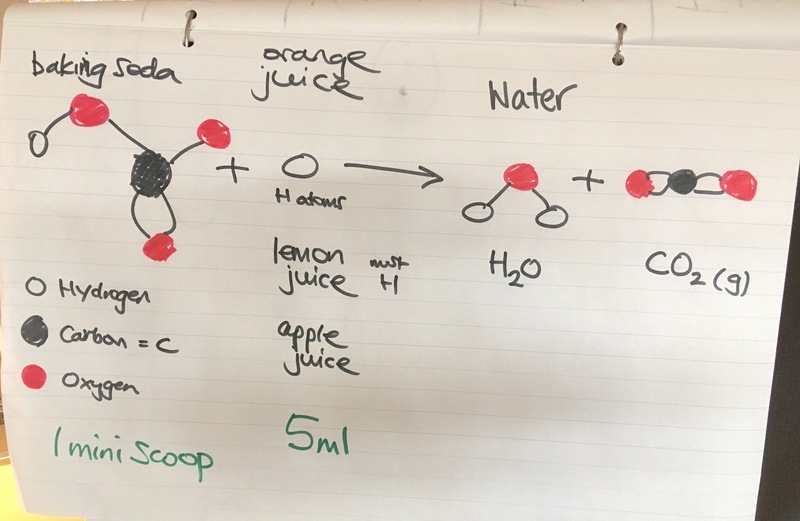 The chemical reaction they just modelled, is the same as what is happening when they make orange juice and baking soda to make their soda drink. Canned sodas are fizzy because they have carbon dioxide gas in them. Soda fountains inject carbon dioxide gas into drinks. Anything that has free H atoms (ions) is acidic and tastes sour. The more sour it tastes the more H ions it has e.g. lemon juice has more H ions than orange juice. We add sugar to drinks to mask the sour taste. Start by making a soda drink with orange juice, as in Procedure A. Give them the starting molecules, and ask them to rearrange the atoms and bonds to figure out what molecules are made (given them a hint that one of the end molecules is water). Some juices have fewer H atoms in them, so when baking soda is added, they will make fewer CO2 molecules. Therefore fewer gas bubbles are made. 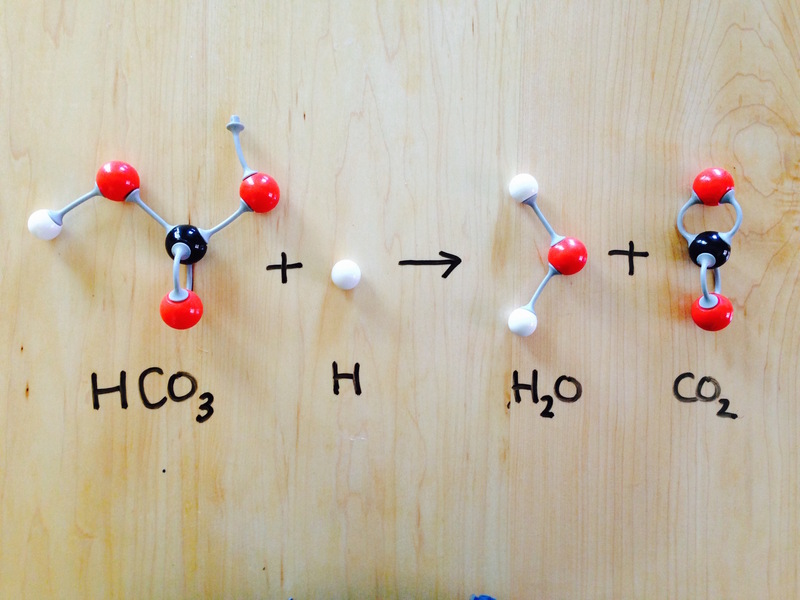 Juices with more H atoms in them can make more CO2 molecules, so will make more bubbles of gas. Give student groups squeezy bottles of the juices, three 15ml tubes in a rack (one tube for each juice type), baking soda in a pot with a mini scoop. 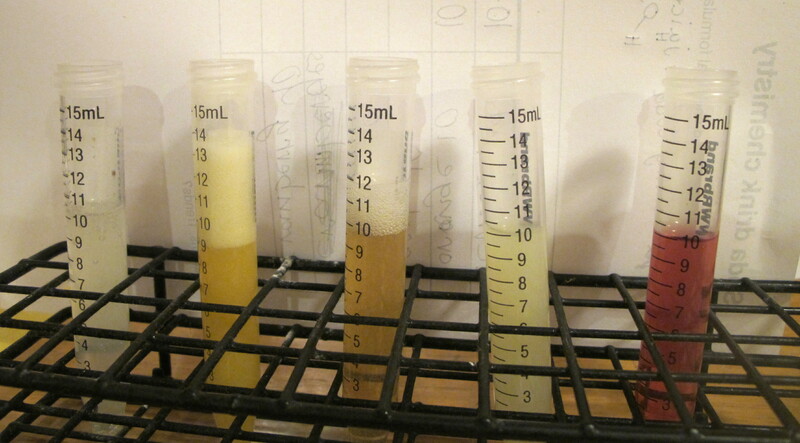 Students write on some paper under the tubes to record which juice will go in which tube, then add 5ml each kind of juice to its respective tube. They then add one mini scoop of baking soda to a juice, use a stir stick to mix the contents quickly, then remove the stick. Use the numbers on the side of the tube to record where the bubbles rise to for each juice type. 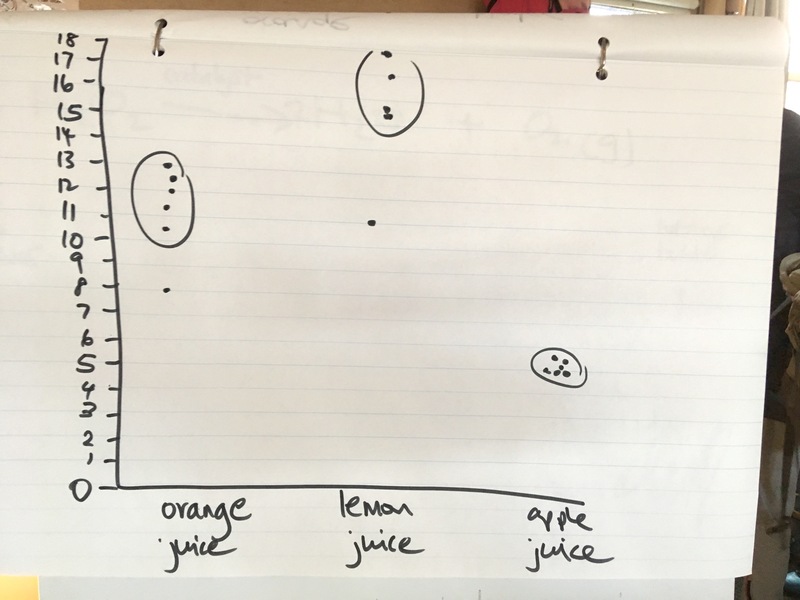 While allowing students to keep experimenting with mixing different juices, bring each group in turn to the board to graph their single-juice results results, juice type on the x-axis and ml the bubbles rise to on the y axis. 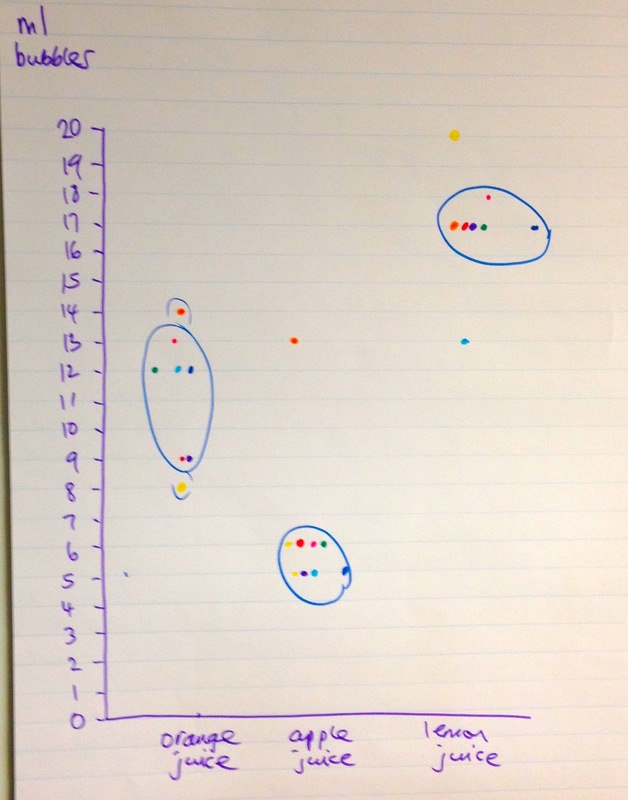 (Ideally each student group comes up in turn add their data to the scatter graph). There will be variation between the groups, but that is expected with real data collection. Which juice makes most bubbles [lemon juice], which the least [apple juice]? Refer back to the chemical reaction: the juice that makes the most bubbles of carbon dioxide must have the most H atoms in it (as the amount of juice and baking soda was the same each time - the only thing that changed was the kind of juice, hence the number of H atoms). Hence the lemon juice has more (or a greater concentration of) H atoms in it, apple juice the least, and orange in the middle. The number of H atoms in a juice determines how acidic it is, which is the same as how sour it is. So fewer H atoms means less acidic and less sour. And more H atoms mean more acidic and more sour. Students can taste each juice to test if the juice with the most bubbles is also the most sour. Lemon juice will certainly be very sour, and apple juice not sour. A complication is that sugar is added to juices to offset the sourness, so cranberry juice, which is very acidic, and will make lots of bubbles, may not obviously taste the most sour. Students may be able to detect the sourness of cranberry juice behind the sweetness. Students are free to make one more soda drink from the juice of their choice. Adding too much baking soda makes the drink taste funny.